Hillsboro’s Luke Magulac puts the ball in play in a game against the Western Brown Broncos on Tuesday, April 2, at Shaffer Park in Hillsboro. Magulac helped lead the Indians to a 3-1 win over the Whiteoak Wildcats on Saturday at Shaffer Park in the Wildcat Wood Bat Invitational Finals. The loss by the Wildcats was the first this season. The Hillsboro Indians handed the Whiteoak Wildcats varsity baseball team it’s first loss of the season on Saturday at Shaffer Park where Whiteoak hosted the Wildcat Wood Bat Invitational that featured Whiteoak, Hillsboro, Rock Hill and Bethel-Tate. Hillsboro and Whiteoak each won their first game of the day against Rock Hill, 8-2, and Bethel-Tate, 5-4, respectively; before squaring off in the tournament finals with the Indians picking up the 3-1 win. After being retired in order in the first and second innings on Saturday against the Wildcats Hillsboro scored two runs in the top of the third inning. Ethan Humphries batted third in the innings and drew a walk from Whiteoak’s Traeten Hamilton with two outs before Ethan Watson drove Humphries in on a line drive single to left after a passed ball allowed Humphries to advance to second base. Watson scored during the at bat of Jared Thompson to make it 2-0 in favor of Hillsboro after Thompson grounded out to third base to end the inning. Hamilton led off the bottom of the third inning with a ground ball single to left field and Zach Harless drove in Hamilton in the next at bat with a double to left field that made the score 2-1. 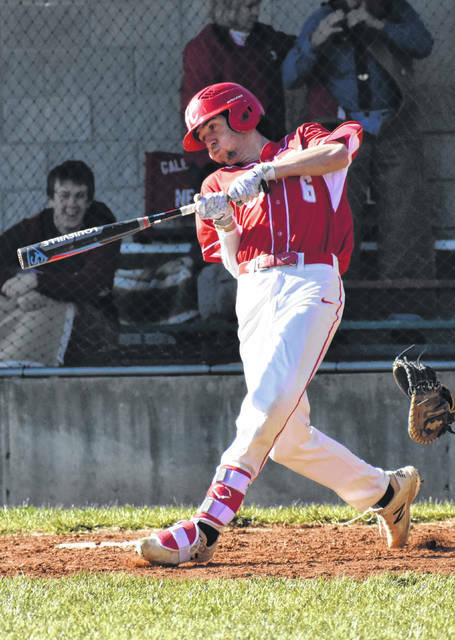 The Indians scored the final run of the game in the top of the fourth inning when Luke Magulac scored, with two outs, on a passed ball by the Wildcats during the at bat of Brennen Priest. Hillsboro threatened to score again in the top of the fifth but, a strikeout by Dylan Boone led to out number two and Magulac grounded into a fielder’s choice to end the threat. Ryan Scott secured the win for himself and his team by retiring all three batters he faced in the bottom of the second including strikeouts in the last two at bats to end the game. Hillsboro hosted the Miami Trace Panthers on Monday at Shaffer Park in Hillsboro in a Frontier Athletic Conference matchup. Hillsboro extended it’s current winning streak to five games with a 5-1 win over the Panthers on Monday night in Hillsboro.